Today is my stop on the blog tour for Sarah Bennett's book, Wedding Bells at Butterfly Cove. It was only as I was preparing to read this book that I remembered I hadn't actually read the first in the series, Sunrise at Butterfly Cove. Having now read both, you could read them as stand alone novels, but me being me - I like to read things in order and so in a mad dash 2 days ago, I switched of all distractions, made a jug of tea, grabbed few snacks and lost myself in this gorgeous idyllic world the author had created. I therefore and bringing you a double review - what a treat eh! 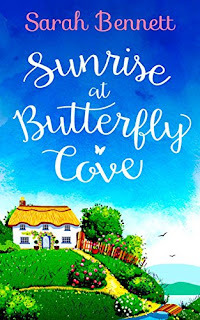 I was instantly drawn initally to Sunrise at Butterfly Cove for the gorgeous cover is host - I mean just look at it, it screams peace and quiet and fabulous scenery - and the book didn't fault in that department either. What I loved about this debut from Sarah Bennett was a brilliant and detailed prologue. We were immediately given some back story to both Daniel and Mia, our main characters to the story, and learnt that Daniel had lost both his parents, his Father passing just before Daniel made a name for himself as a world class photographer and his career launching. Whilst Mia is faced opening the front door to police officers informing her that her beloved husband Jamie had been killed in a road accident on his way home. We move on then to the bulk of the book and Daniel has decided he needs to get away. His celebrity lifestyle of drink, drugs and a long stream of women - the latest being Giselle - has taken its toll on Fitz - his celeb name - and if he doesn't make the break now, he fears his life will spiral out of the little control he has left. So swiftly packing a bag, he jumps on a train and heads to the West Country. Daniel has no plan, no direction, but fate is forced upon him when his train reaches the end of the line and he is brought to from his daydream by a kind stranger. Madeline, or Mads as she is known, takes Daniel under her wing, explaining that there is nowhere left to go on the train and that she can give him a lift to a place she knows that he can stay. I just want to say at this point that I adored Mads and her husband Richard. We learn throughout the story that they were unable to have their own family and have pretty much taken Mia under their wing, supporting her in her grief but they have enough love for Daniel too plus other characters we meet a long the way. Mads is a meddling old bag but with the kindest of hearts whilst Richard just goes with the flow but adores his wife - honestly, these two could have a book of their own written! Mia has purchased Butterfly House as an escape from the home and life she made with Jamie, but the building is run down and in dyer need of some TLC. Mia is far from impressed with Mads dumping Daniel on her doorstep but agrees to give him a week to sort himself out and in return for his board she gives him a list of chores to help get the house in shape. Two broken hearts, both characters having their share of emotional outburst should be a recipe for disaster but this only draws them closer and a week turns to two, that in turn moving on to a month. Daniel quickly realises his feelings for Mia but allows her to guide the time on this new relationship. When Daniel offers Mia a propersition of converting the barn into studios and work spaces as an artists retreat, she agrees - allowing him in to her life for the first time as permanent fixture. Although Sunrise at Butterfly Cove is ultimately a love story, it is warm and romantic and has equal parts of humour and drama. We are introduced to Mia's difficult childhood and her sister Kiki plays an important role within one of the sub plots. Things between them, their youngest sister Nee, and their parents are very strained to say the least. Likewise, Aaron (Daniels best friend) and his younger brother Luke also play important sub roles and altogether Sarah has created a delightful group of characters that you can't help but lose yourself to within their stories. Wedding Bells at Butterfly Cove is just as wonderful to read as Sunrise at Butterfly Cove was and I actually quite enjoyed reading them back to back - I'm sad that Christmas at Butterfly Cove isn't out yet as I would be diving straight into that once I'd finished typing!! 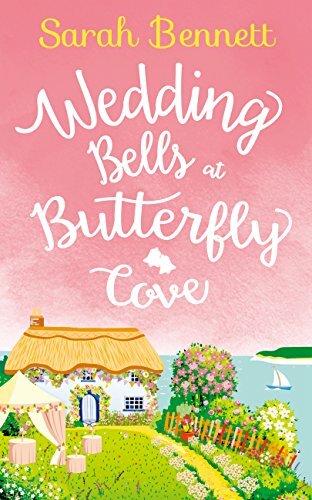 Wedding Bells at Butterfly Cove still heavily features Daniel and Mia, the end of the last book was met with a proposal and now the barn conversion is almost complete and ready for their first bunch of guest to arrive. Mia deep in thought thinks that along with the guest house and retreat, they could also offer bespoke wedding packages now that Mads and Richard have done wonders with the gardens. Although they would need to trail this first! Mia and Daniel getting hitched, there is so much more to enjoy reading along side. Kiki is in a troubled relationship and when her husband Neil gets a 3 month work placement in Greece, she uses this oportunity to pack up her belongings and escape her unhappy life. With two children in tow - six year old Matty who is very aware Daddy calls Kiki stupid and that she cries a lot, and his younger sister Charlie - the only place she feels she can escape to is Butterfly Cove. When Neil is out of the way, Kiki rings and is met by Daniel's friend Aaron answering the phone, not knowing who is was he lets slip that the guest house is full. When Kiki breaks down and explains everything, Aaron offers her and the two children his cottage as a sacturary. Aaron has seen how wonderful the life in Butterfly Cove has treated Daniel that he waants some for himself and found, by chance, a gorgeous chocolate box cottage, but with four bedrooms, he was rattling around and with things in his life also being far from perfect, he welcomed the distractions. As with Daniel and Mia, Mads knows best and can see that even though Kiki and Aaron are having troubled times, they are perfectly right for each other and during some alone time Kiki takes the chance to kiss Aaron and grabs it with both hands. Something Luke, Aaron's younger half brother, recently said to him has stuck in his mind though and despite his feelings, he puts the breaks on any relationship before it gets going. With Mia and Daniel's wedding looming, and Kiki having to return home to sort our her divorce and custody of Matty and Charlie, Aaron does some soul searching and reaches out to Luke's mum. his step mother, to find out why she's hated him for so long. Opening up makes him realise that life is too short and during his best man speech and the wedding, he has more to say than just the usual banter you normally hear. I loved reading more about Kiki and Aaron and their back stories and they tied in nicely with the current plot and to the main characters Mia and Daniel. Aaron's relationship with Matty and Charlie was heart warming and there were often scenes where I found my eyes had misted over whilst reading - I am a sucker for sentimental moments! What I didn't embark on in Wedding Bells at Butterfly Cove though, was the little snippets Sarah gave us into Luke's life. I don't want to say to much but we discover when he is talking to Aaron that he fell in love at first sight but she upped and left without a word and broke is heart. When the wedding day arrives so does the girl's youngest sister Nee, who had been living it up in New York - but at the station she comes face to face to Luke and he introduces her to Aaron as his wife... WHAT?!! Things are tense but they decide the wedding should go ahead and its left me seriously hoping that Christmas at Butterfly Cove see's Luke and Nee get their happy ever after just as Daniel found with Mia and Kiki, Matty and Charlie have found with Aaron. Plus I can't wait to see what the meddling old bag Mads is up to next ! !